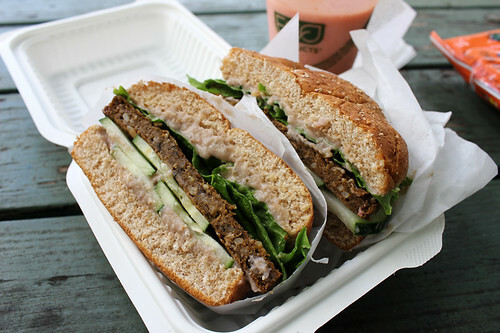 Yum Veggie Burger: Hanalei Taro & Juice Co. 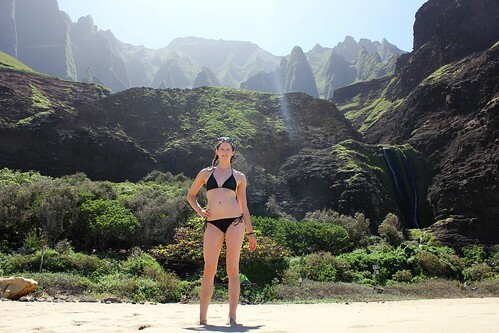 This is my 6th and final veggie burger review from my recent vacation in Hawaii (yup, that’s right, I ate 6 veggie burgers – 2 on each island that I visited!). 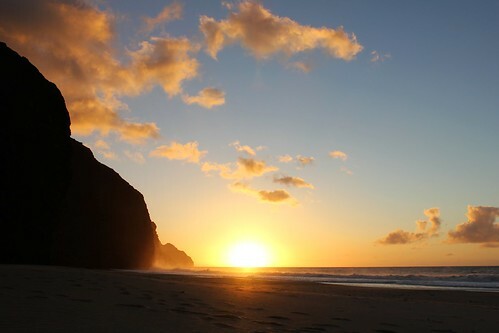 Eventually though, I had to leave paradise and return to the real world. 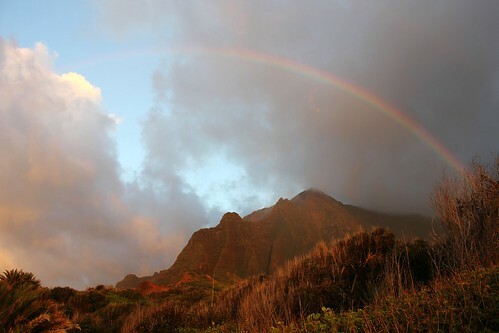 As I hiked back out of the valley, I was looking forward to eating a veggie burger once I got back to the town of Hanalei. 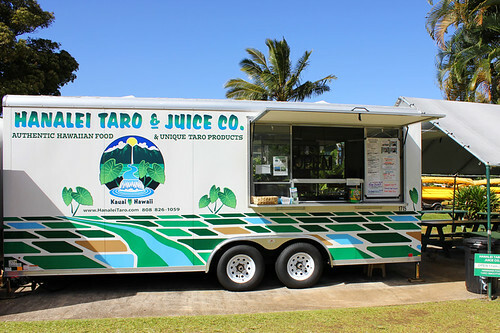 @janakj had given me a recommendation via twitter: The Hanalei Juice & Taro Co. The Hanalei Taro Veggie Burger: a vegan patty made from taro root and leaves, black beans, brown rice, quinoa, flax seed, rice flour, acai, and a special blend of herbs and spices. But even if I hadn't been hiking all morning looking forward to this burger, I would have definitely still said it was delicious! The patty was richly textured and well-flavored. The bun was soft and fresh (and vegan – they checked the ingredients list for me, so nice!). The taro hummus was excellent, a little lighter than regular chickpea hummus but still flavorful, and a nice addition to the burger. And the cucumbers and lettuce added the perfect green crunch to the whole thing. 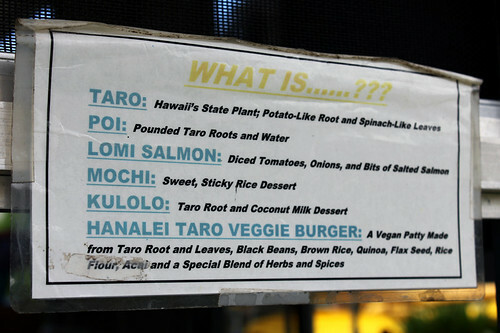 Oooh, that sounds like the best veggie burger you've had in Hawaii!! So different! And the patty looks like it holds together well. 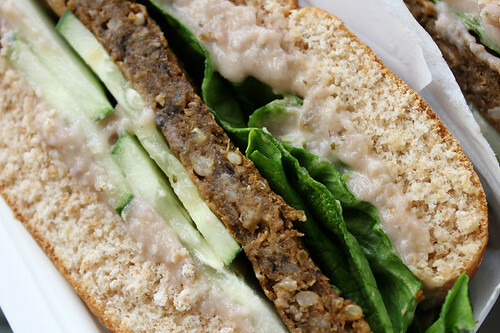 Stumbled upon your blog today, never thought i'd find a blog dedicated to Veggie Burgers. As a fan of Veggie burgers yours is one blog i'd be frequenting.